This leads to healthy, bushy plants while reducing greenhouse temperatures. In addition, there is less risk of plants scorching while achieving an optimum rate of photosynthesis. Solar-Ice creates higher yields and stronger-than-normal root systems, making it a excellent choice for ornamental plants, nursery stock and tomatoes. Greenhouse owners have long contended with the loss of heat from greenhouses during the night and at times of cool weather. That is why high level of thermicity of Solar-Ice is so important. Research conducted in Europe shows that, in greenhouses covered with Solar-Ice, the total solar heat load was reduced by over 20%, without any significant decrease in PAR light. Your workers and customers will enjoy this more comfortable environment and you can expect this will be reflected in productivity, too. Call 1-800-531-4769 if you have any questions! Please call for inquiries on volume purchases. 1. Check that the frame, structure or wall to which the insect screen will be fastened is as square as possible, to eliminate twisting or shortage of fabric. 2. Metal parts should not touch the screen. In the summer, heat accumulates in metal parts, and might damage the plastic screen. Therefore, it is important to cover metal parts with white water based latex paint or white tape to protect the screen. 3. When you install the screen, keep the screen square and parallel to the sides of the greenhouse. This will keep the fibers of the screen parallel. If the fibers are not parallel to the greenhouse sides, the screen will be shortened in length and in width. 4. 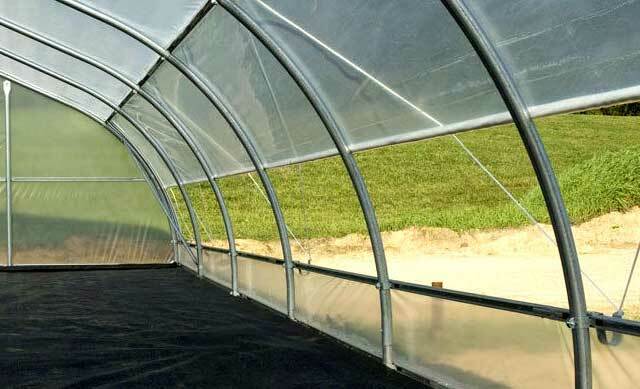 When you install several screens together which have not been stitched, you should connect the first screen to the sides of the greenhouse. Then, connect the second screen to the first one and to the greenhouse sides.